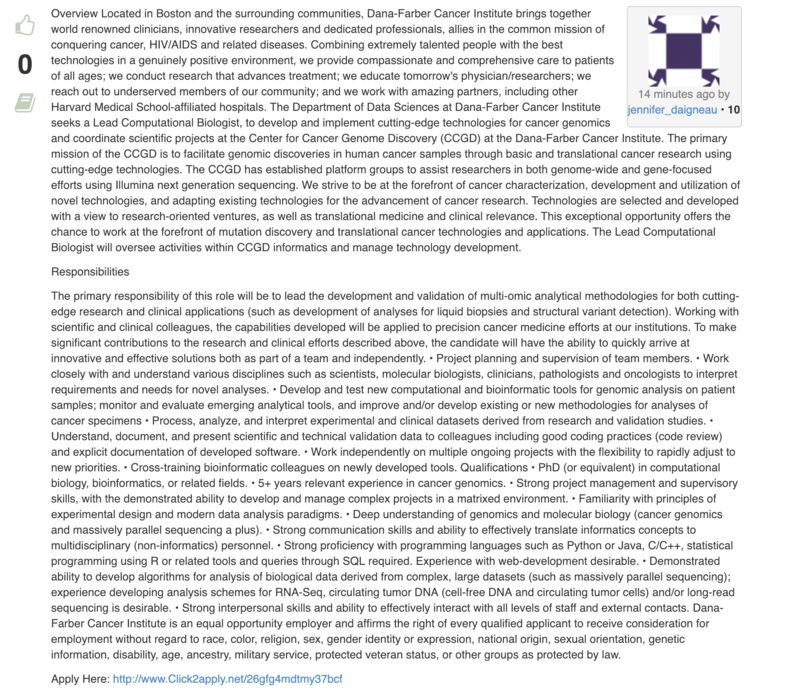 The Department of Data Sciences at Dana-Farber Cancer Institute seeks a Lead Computational Biologist, to develop and implement cutting-edge technologies for cancer genomics and coordinate scientific projects at the Center for Cancer Genome Discovery (CCGD) at the Dana-Farber Cancer Institute. The primary mission of the CCGD is to facilitate genomic discoveries in human cancer samples through basic and translational cancer research using cutting-edge technologies. The CCGD has established platform groups to assist researchers in both genome-wide and gene-focused efforts using Illumina next generation sequencing. We strive to be at the forefront of cancer characterization, development and utilization of novel technologies, and adapting existing technologies for the advancement of cancer research. Technologies are selected and developed with a view to research-oriented ventures, as well as translational medicine and clinical relevance. This exceptional opportunity offers the chance to work at the forefront of mutation discovery and translational cancer technologies and applications. The Lead Computational Biologist will oversee activities within CCGD informatics and manage technology development. Also, I'd recommend reformatting a copy-paste so the post looks better. See the below image vs the post now to see the difference proper formatting can make.